Full cut to fit over work-shoes or boots. Resistant to extreme cold. Slip-finish inside for easy on and off. Priced for exceptional value. Has three position top snap closure. to salt water, solvents, acids, alkalis, ozone, blood, grease, tar, gasoline and oils. Sizes: Mens 7-14 (whole sizes only). and outside non-corrosive suspender. 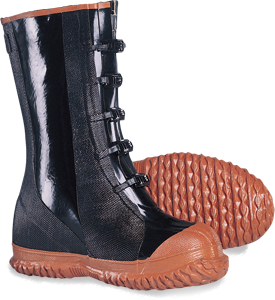 Molded boots have steel shank with non-skid cleated soles. Suspenders sold seperately. 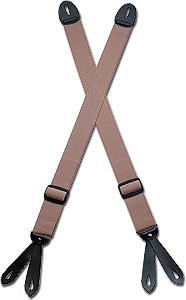 Regular adjustable straps leather attachments. Perfect for nearly all industries: Construction, farming, fishing, food processors and manufacturers. 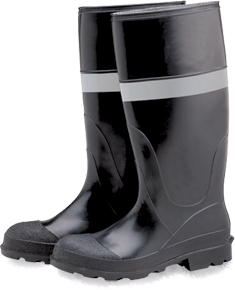 Made of strong, heavy gauge, lightweight, low temperature, abrasion resistant vinyl 100% leakproof protection. Cleated, molded heels and deep sure grip cleated soles for non-slip trction. Special molded-in-place inner sole. Fully Lined. Resistant to salt water, solvents, alkalis, ozone, blood, grease, tar, gasoline and oils. Same as PB-16 with reflective strip. 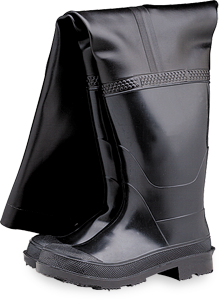 Same as PB-16 with steel toe. Steel toe meets American Safety Standard. Same as SB-16 with a steel midsole. 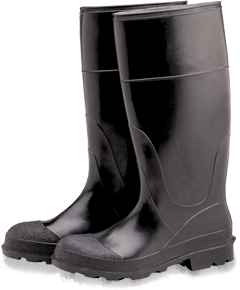 30" Hip boot made from premium grade rubber. Ozone resistant. Heavy duck lining. Cushion insole multi-ribbed sole steel shank heavy cleated outsole. Same as PB-HIP with steel toe. 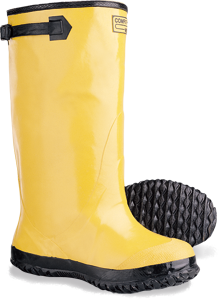 Steel toe meets ANSI standards. 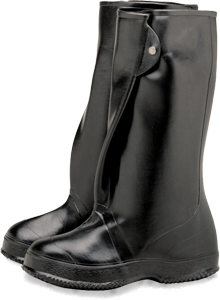 17" rubber legging over-shoe boot. Full cut for easy fit. Fully lined, extra wide last, adjustable strap with buckle on top. Heavy cleated sole. Same as SLB in black. 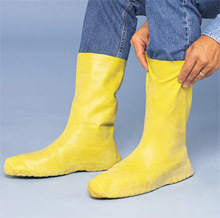 Yellow stretch latex "NUKE"/HAZ-MAT bootie. 12" height, .50mm thickness, S,M,L and XL. 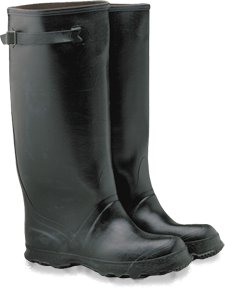 Heavy duty 5 buckle rubber over-shoe boot with wide last. Made from premium grade rubber. Ozone resistant. Cotton lining self draining gusset, ribbed sole. 14" high. guards provide protection equal to ANSI-Z41 standards.